Guides need to be specifically licensed for Bako, so instead of Panch I was collected by Louis (pronounced Luis in the Spanish fashion) for my day trip to Bako National Park. After a transfer by car to the jetty, Louis organised paying the entry fee and we set off by small boat to Bako. This national park is flanked by beautiful limestone cliffs. Unfortunately the sun was right above them, so none of my photos came out, meaning you will have to picture it for yourselves. The sea was jade green, the sky blue and the creamy cliffs topped with green jungle. Bako is beautiful even before you start to explore it and see the creatures that make their home there. 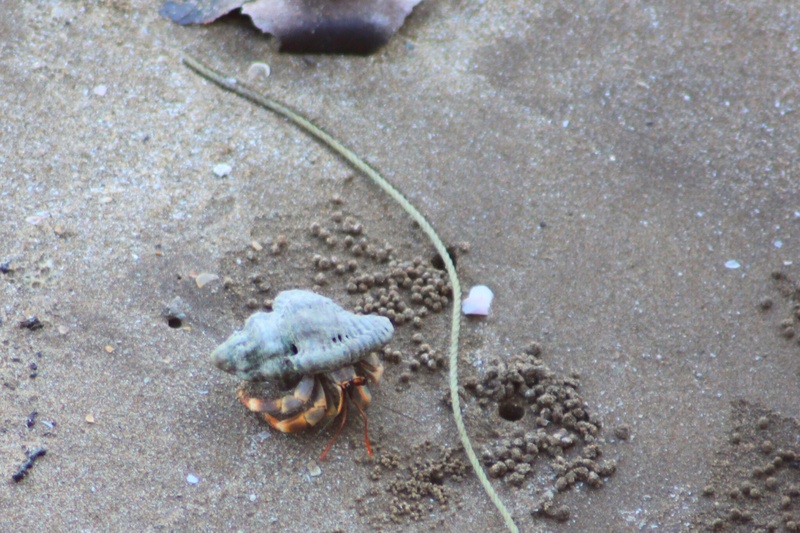 We landed at the jetty and immediately Louis pointed to a hermit crab on the beach below us. 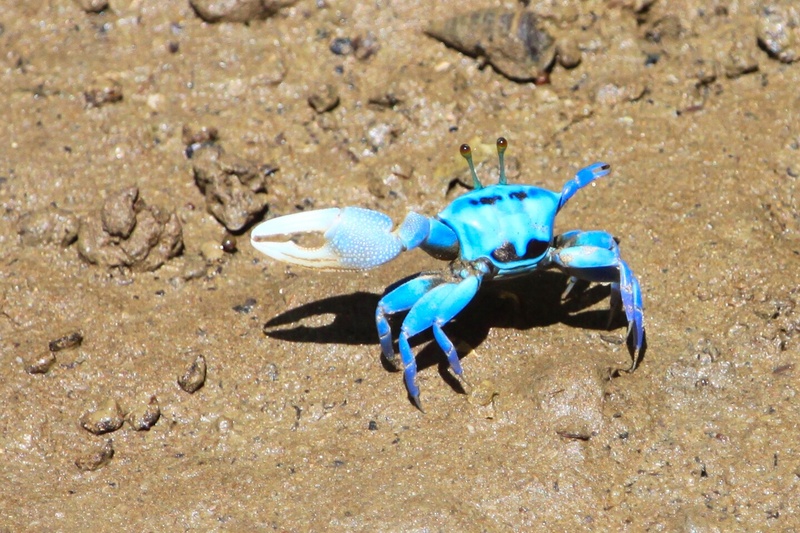 There were also bright blue fiddler crabs with their one giant pincer and fish walking on the beach. 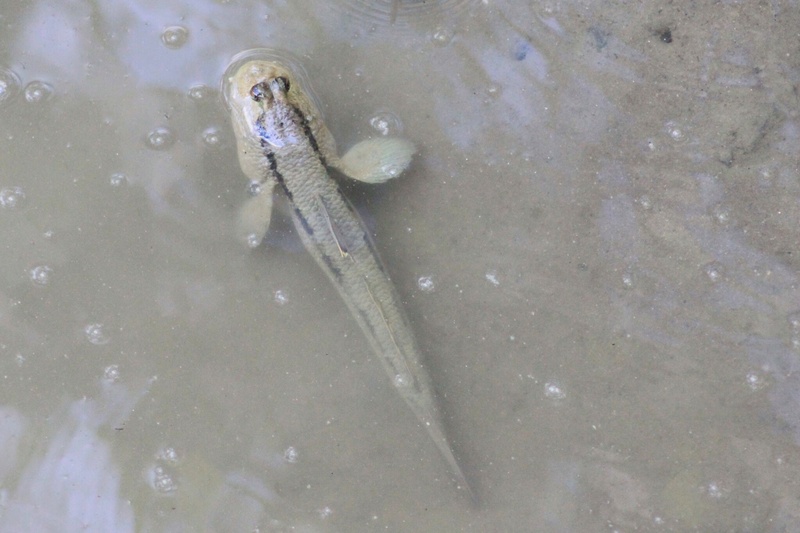 Lots of tiny mudskippers darted about across the sand. Of course, they are not fish but amphibians, but it does look for all the world like a bunch of fish have decided to take a stroll on the beach. Bako has many miles of trails, but Louis assured me that the best animal sightings were in or near the camp. 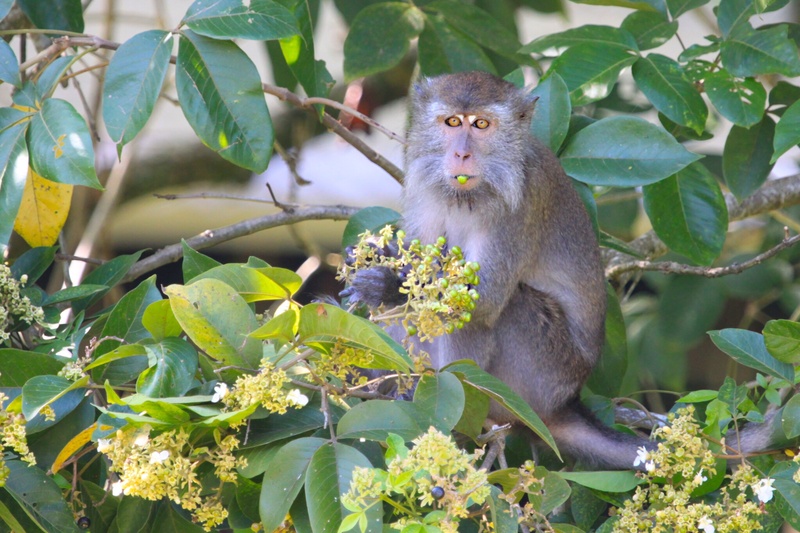 After signing in, we walked around the camp and immediately saw some long tailed macaques sitting in a tree behind the main building. 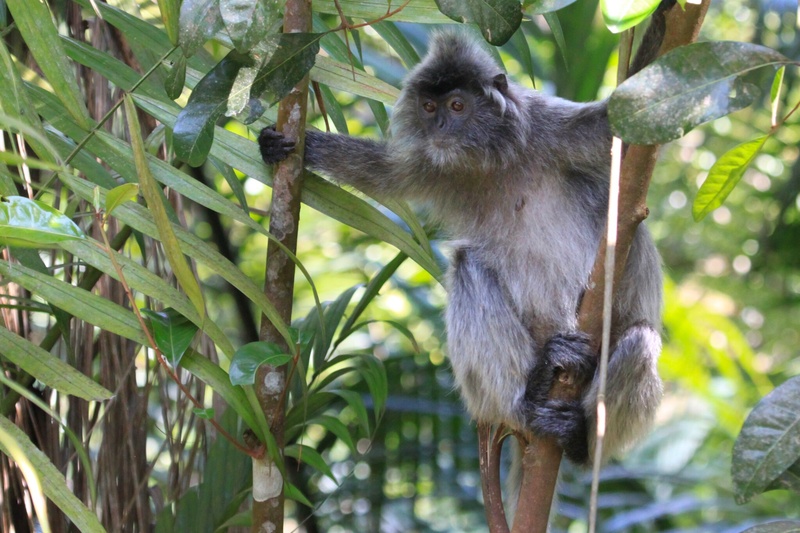 My first Borneo primates! 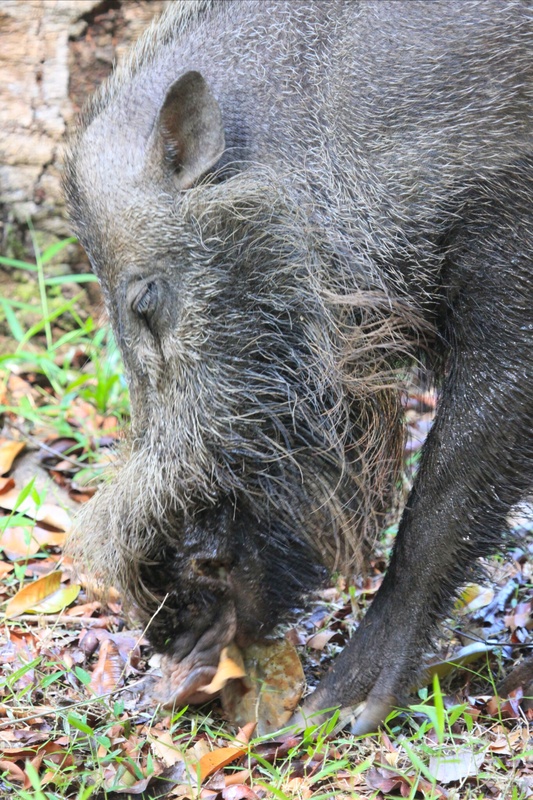 As we walked along the boardwalk through the camp, we saw a large bearded pig foraging in the ground. 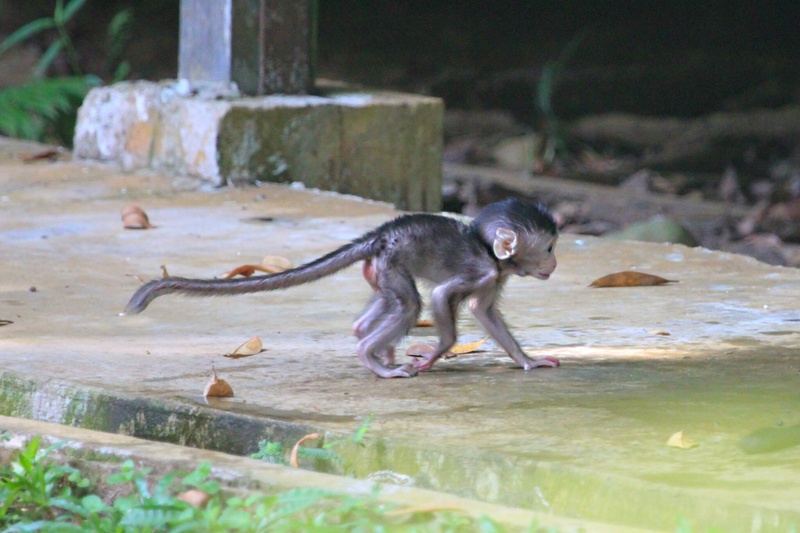 After watching more macaques drinking from a dripping tap, we set off into the forest on one of the boardwalks near the camp. It was very hot and humid, and we walked slowly through the dark rainforest. Louis pointed out the huge base of the durian tree, with its famously malodorous fruit, which has a broad buttress. 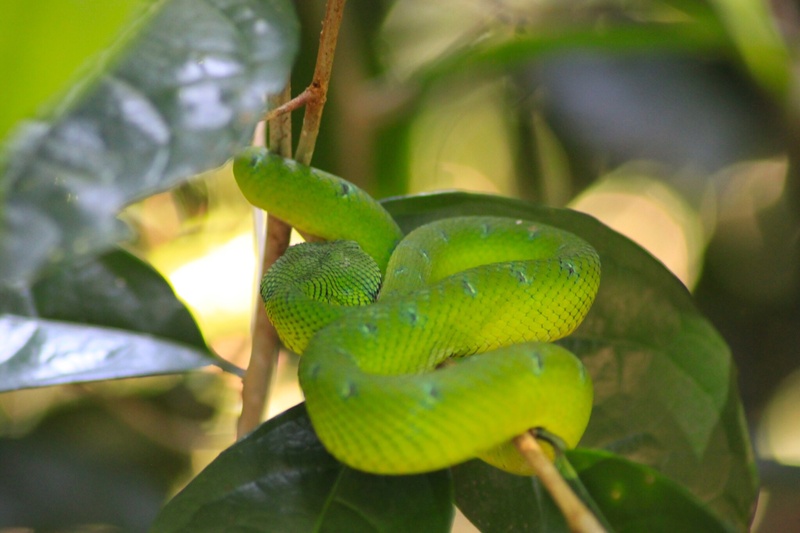 Right next to the boardwalk, about a metre above the ground, Louis pointed out a gorgeous, bright green pit viper coiled on a branch. It was not moving, so I was not afraid to take its picture, but I was not about to go looking for its head in case I disturbed it. We also found a terrapin in a tiny pool and a little swiflet sitting on its nest, both too dark to photograph. There were lots of beautiful bright blue butterflies, which when at rest look like a dried brown leaf, but in flight are an iridescent purple blue. 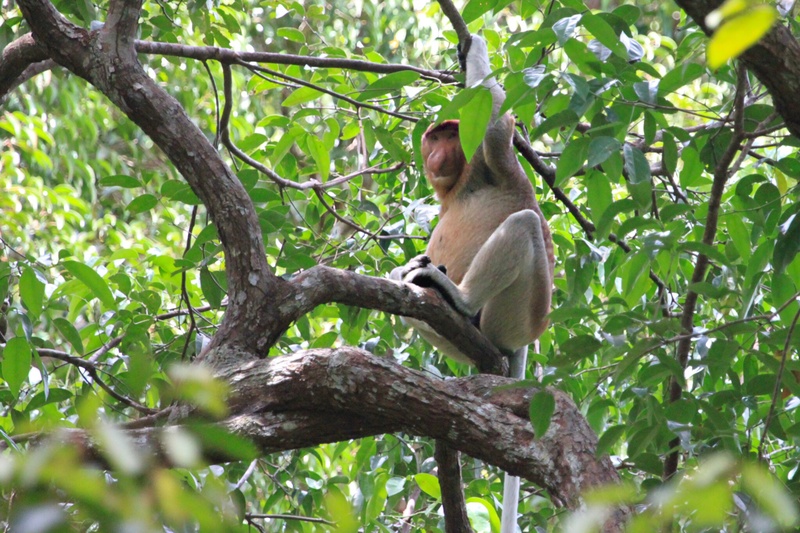 As we passed a steep path to another trail, we heard proboscis monkeys calling. We headed up the steep path strewn with tree roots and peered into the canopy. At last we were rewarded with a flash of bright fur. 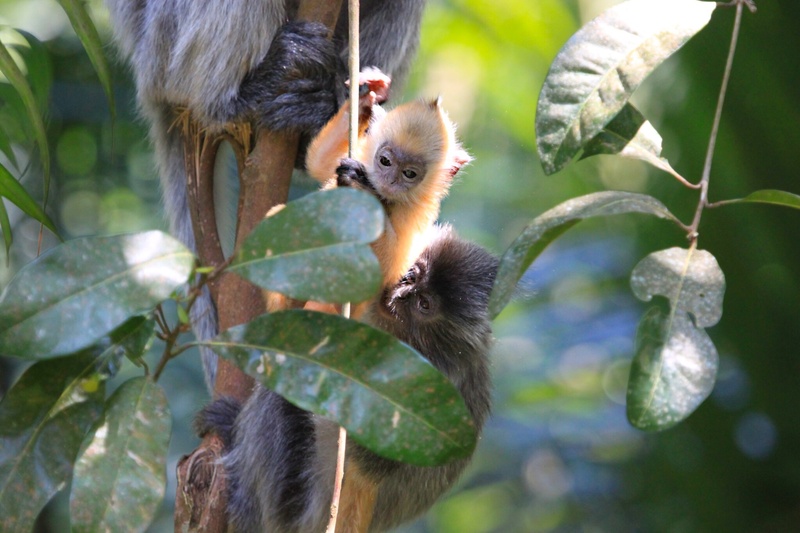 We saw the distinctive flash of orange fur, but they were high in the trees and hard to see. We headed round another trail to see if we had a better view from the other side. Again we could see the monkeys swinging through the trees, but they were far away. We went back to the original trail and waited. We were joined by a German couple and their guide and we sat until our patience was rewarded and we had a clear view of both the male with his pendulous nose and the female with her more dainty retroussé nose. They are fascinatingly odd-looking creatures, with huge, grey hands and feet, big pot bellies a long white tail which looks like a G-string from behind, and, in the case of the male, a bright red chilli pepper, as the Germans’ guide put it. Their backs and shoulders are orange or red, and they often have bemused expressions, as though slightly drunk. Their pot bellies house a chambered stomach full of bacteria to help them digest leaves. While we waited, we were treated to the sight of two tiny nuthatches hopping up the trunk of a huge tree. 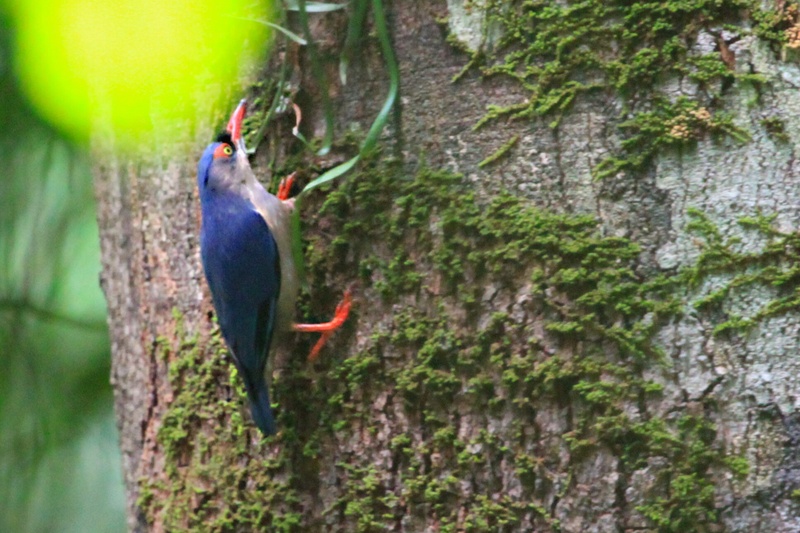 These funny little birds hop vertically up and down the tree trunk as comfortably as though they were on the flat. Getting any photos in the forest is a challenge as there is so little light, and inconveniently located leaves often spoil what is otherwise a nice shot. Heading back to the camp, we pointed out the viper to the German couple before eating our packed lunch in the canteen, which has hand basins for washing before eating and welcome ceiling fans. We were joined by the Germans, Norbert and Sigrund. Who says ginger babies aren’t cute? 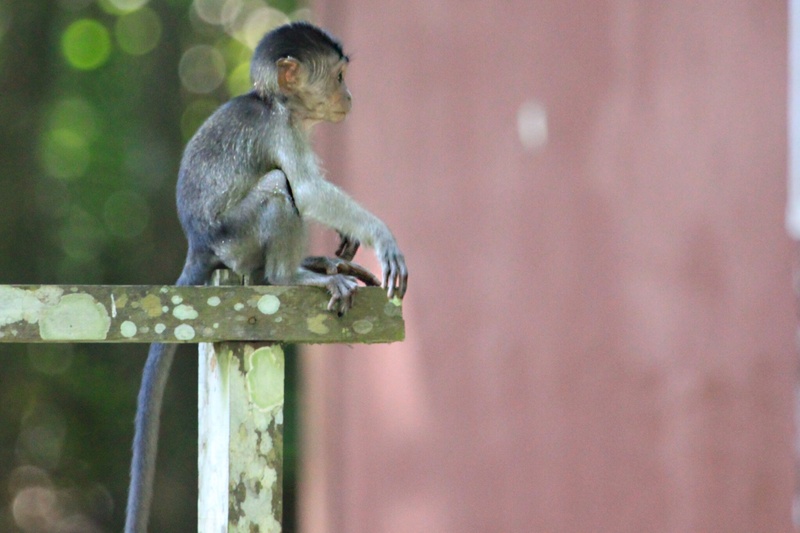 After lunch, we headed around the back of the camp through the staff quarters looking for silver leaf monkeys. We could hear monkeys but could not see anything. 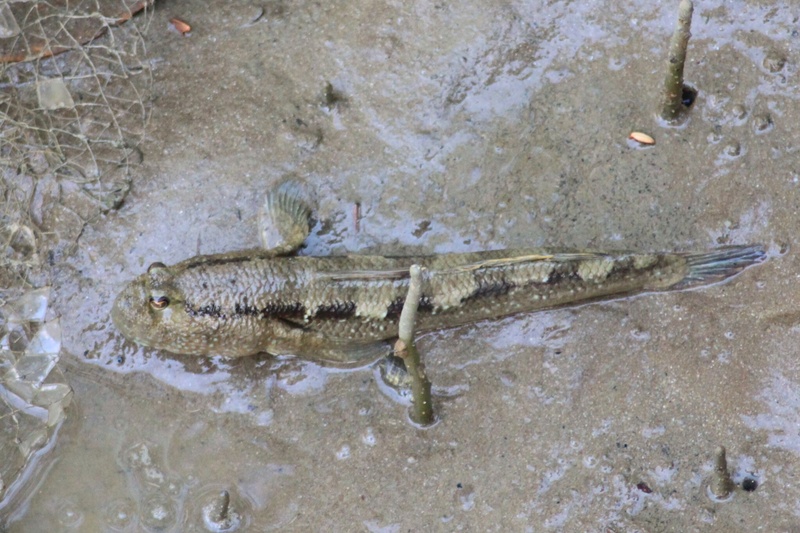 We came to a boat shed from where we saw a large mudskipper both in and out of the water. 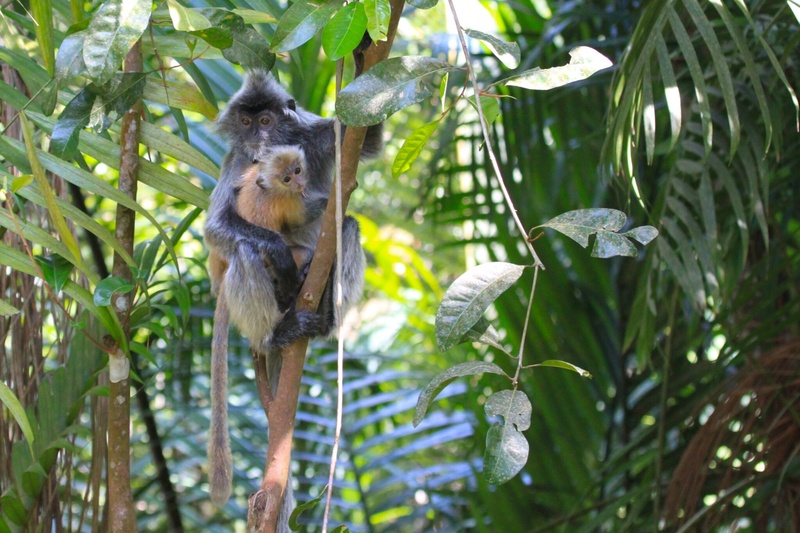 We had one last chance to look for silver leaf monkeys before leaving. Behind a chalet, success! There was a small family group feeding. I moved slowly towards them keeping my back pressed to the building, and they allowed me quite close to photograph them with their endearing Mohicans and bright orange babies. They care for their babies communally, and you can see a youngster moving from one adult to another in my third picture. After that rewarding sighting, we headed to the beach where we waded out to our boat in the warm sea water. 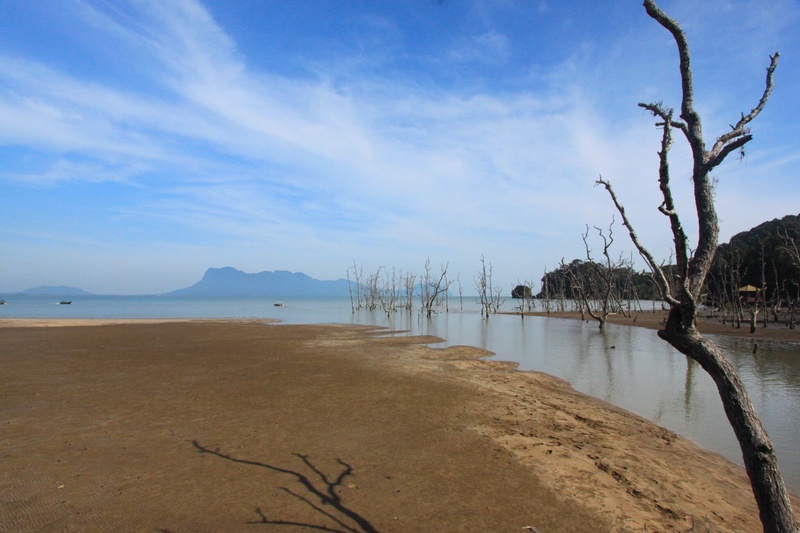 The warm air rushing past the speeding boat soon dried our feet, and we returned to the jetty quite dry, ready to return to Kuching. 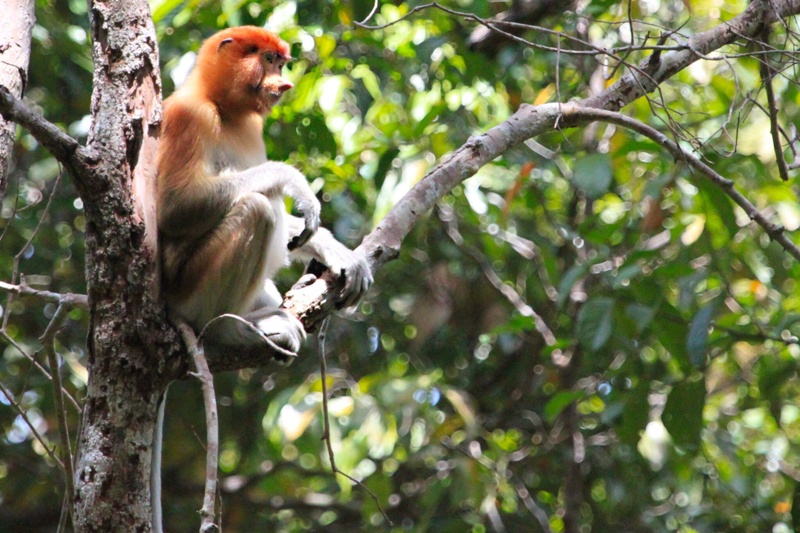 I was very hot, but had a very successful day’s wildlife viewing; just what I had come to Borneo for. It is worth getting a guide for Bako, as I would never have seen the silver leafs or the viper without Louis. I suspect it may also be worth spending a night there, to see some of the nocturnal creatures. 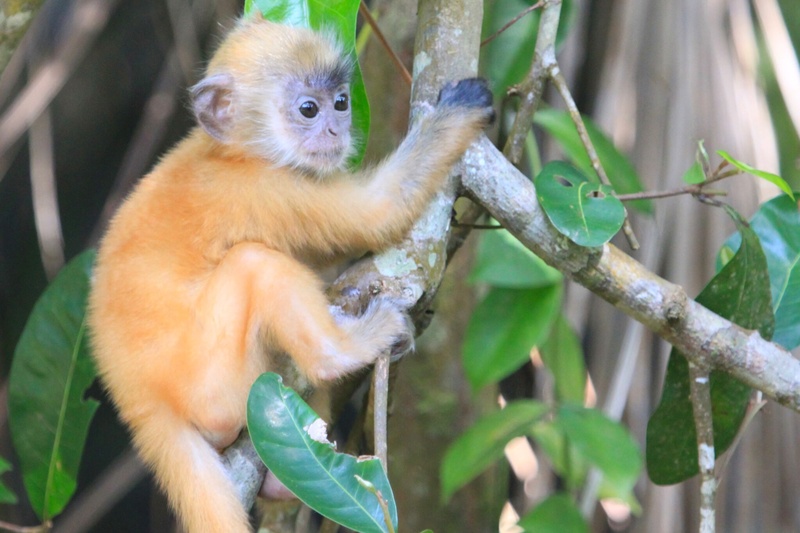 This entry was posted in Malaysian Borneo and tagged Bako National Park, pit viper, proboscis monkey, Sarawak, silver leaf monkey on 07/08/2014 by paulaclarke.